Incredible India welcomes you to explore a slice of her marvels. 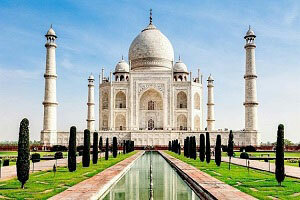 The itinerary of India Tour will take you a journey to explore the hidden treasures of this Indian subcontinent. Your arrival is at Chennai, the capital city of Tamil Nadu, often referred as ‘Gateway of South India’. Mahabalipuram, which is famous for its UNESCO world heritage monuments. Your next stop will be at a French city, Pondicherry. The journey proceeds covering some of the best architectural temples like Gangaikondacholapuram, Darasuram and Thanjavur, collectively called as ‘Great Living Chola Temples’. Chettinad, which offers you a village tour. Madurai, one of the continuously inhabited cities in the world. Further Proceed to ‘God’s own country’ - Kerala. Explore the wildlife activities in Thekkady and then move on to the renowned backwaters of Kerala namely Kumarakom and Alleppey. Take a long stride to Ooty, the famous hill station in the Western Ghats. Have an adventure forest safari tour at Bandipur in Karnataka and reach Mysore to have a glimpse of this heritage city. Experience the majestic Chalukya & Hoysala architectural kingdoms in Hampi. 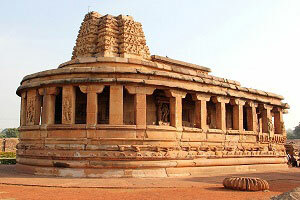 Aihole, Pattadakal and Badami are on par with Hampi with attractions galore. Start your first Beach tour in Goa. Moving on to Maharashtra leads to Ajanta & Ellora Caves monuments in Aurangabad. Your tour ends in Mumbai, the commercial capital of India. Finish your breakfast and drive to Pondicherry (Puducherry). Enroute stop at Kanchipuram Temple Tour. Dedicated to Lord Shiva, the Ekambareswarar Temple has been spoken about by Tamil poets who lived in the 2nd century. During the rule of Pallavas, the original structure was pulled down and new temple was built. During Chola dynasty, the temple was improvised. The temple in its present form was the work of Krishnadevaraya, the most famous Vijayanagar King in the year 1509. Belonging to the 8th century, Kailasanathar Temple is one amongst the oldest structures in the city and it is dedicated to Lord Shiva. Pallava kings were famous for their love for architecture and one glance at the temple would suffice to understand the importance they attached to arts and architecture. The stone carvings with intricate and dedicated workings are beyond words. In the morning after your breakfast visit the Tanjore Sculptural Tour. Thanjavur Art Gallery, situated within the Thanjavur Royal Palace, is one of the main attractions of Thanjavur town. Thanjavur Art Gallery, which is housed in the Nayak Hall of the place, has an extensive collection of stone and bronze statues and idols belonging to the Chola period (8th - 9th centuries). Bronze statues belonging to the Pallava period are also displayed here. Art Gallery also displays murals, paintings, sculptures and other artefacts that can be dated to the period in between 8th and 18th centuries. Visit the famous Brihadeeswara Temple also known as Big Temple, built in the year 1010 AD by the mighty Chola Emperor Raja Raja Chola. It remains as one of the greatest glories of Indian architecture. This temple is a part of the UNESCO World Heritage Site known as 'Great Living Chola Temples'. Explore your Adventure Tour in Bandipur. Located on the trijunction of Tamil Nadu, Karnataka and Kerala, Bandipur National Park (and Tiger Reserve) is one of the wilderness areas in the country. It is the places where you can sight the extinct tiger species easily. Since it comes under Nilgiri Biosphere Reserve, it is a well protected jungles of the state. Stay for at least 2 nights in the available resorts will surely bring wild experience. Safaris are arranged by the resorts and carried out by Karnataka forest department in the mornings and in the afternoons. Overnight stay in Bandipur. Visiting Karnataka remains incomplete without a trip to these UNESCO Village Tour. Hampi is an extremely significant place in terms of history and architecture. The first settlement in Hampi dates back to 1st century AD and a number of Buddhist sites belonging to that time have been found nearby. The seat of the Vijayanagara Empire was established by Saint Vidyaranya in 1336 AD with the help of two of his disciples, Hakka Raya and Bukka Raya. The kingdom flourished under the rule of Emperor Krishnadevaraya and stretched over the states of Karnataka, Andhra Pradesh and Maharashtra. After your breakfast, start your day for Mumbai Metropolitan City Tour. Mumbai is the city of dreams and hardened workers, starlets and gangsters, creative minds and servants, beggars and billionaires and more different people than you can imagine. Ask any Mumbaikar, and they'll tell you that they can't imagine being in another city. They are true indeed! Once you belong to Mumbai, you cannot belong anywhere! Siddhivinayak Temple is dedicated to Lord Ganesh and the temple was originally built by Laxman Vithu and Deubai Patil on November 1801 AD. The old temple had an ancient architectural style, consisting of a hall, a sanctum sanctorum, some free open space, the temple's administrative office to the right and a water tank in the front. It is one of the most beloved temples among Mumbai people. Prince of Wales Museum, is one of the premier art and history museums situated on the southern tip of Mumbai. It was built to honor and commemorate the visit of King George V to India. This day you will be transferred to Chhatrapati Shivaji Maharaj (Mumbai) International Airport for your flight back home!